Good heavens, it’s been a month and a half since I last posted! It’s not for lack of hikes, certainly: we’ve been doing two just about every week since my last post. Maybe it has more to do with the gloomy winter weather than anything else. I have a lot more trouble waxing eloquent about gray skies and slush than I do about blue skies, green fields and singing birds. But before moving onto some of the current hikes, it’s worth backing up to one we did on the last day of February, just because it was something new and a little out of the ordinary. On the last day of February we went hiking in historic Greenbelt, MD, to have a look at the Federally planned and constructed community that was established there in 1937. 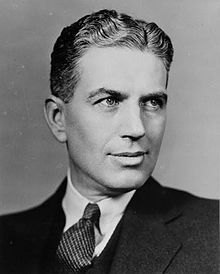 The project was principally the brainchild of Rexford Tugwell, the head of the Resettlement Administration during the administration of Franklin Delano Roosevelt (FDR), and a member of FDR’s so-called “Brain Trust.” The community was a utopian social experiment in urban development that sought to construct a new self-sufficient city and provide housing for young government workers. Greenbelt and FDR’s New Deal are inextricably intertwined. Unfortunately, the idyllic state the delegation saw during their 1927 visit was a fleeting calm before Stalin’s consolidation of power. By the end of 1927 Stalin had eliminated most of his rivals and implemented the first of his Five Year Plans. During the period from 1928 to 1933 over a million and a half so-called “kulaks” (from Polish kulak; ‘fist’ or ‘tight-fisted’; i.e., supposedly well-off peasants) were exiled to concentration camps known as the Gulag, and an estimated 2.5–7.5 million Ukrainians had died of deliberate starvation in what is today known as the Holodomor. Even more unfortunately, there was no feedback mechanism to inform those in the West that the “fun” of remaking the world was not going according to plan. The only information filtering out was a combination of Soviet propaganda and enthusiastic reports from apologists like Walter Duranty and Louis Fischer, who denied that any famine was taking place. To make a long story short, the worker’s paradise that inspired Tugwell’s dream was nothing but a lie. Happily, while Greenbelt may have been inspired by a false ideal, the subsequent events did not come to pass here. The layout of the town was designed by Tugwell himself, assisted by the First Lady, Eleanor Roosevelt, and a team of architects and planners. Social engineering had a central role: applicants for residence in Greenbelt were carefully screened for appropriate age, race, religion, income, health, family size, financial reliability, clean living habits, and community spirit. African-Americans were excluded until 1963, and wives were not permitted to work, being expected to stay home and take care of children. Our hike route started outside the Greenbelt Library and took us roughly clockwise not quite 5 miles through the historic district, circling manmade Greenbelt Lake, walking through one of the pathways designed purposefully to wind between the backyards of the residences, before popping out into the town center. The town center was designed to be more or less the center of community activity, but instead of privately owned businesses it featured a cluster of community cooperatives, including a theater and gas station, and administration, library, recreation, and school buildings. Of particular interest is the community center, originally the elementary school and community center. Like many of the structures in historic Greenbelt it was built in Art Deco style. The building features a series of friezes by Lenore Thomas Straus along the south wall. 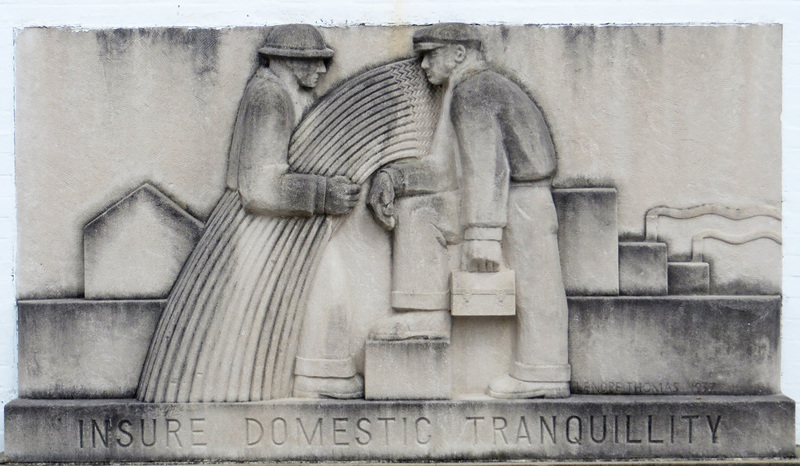 But while Art Deco emphasizes bold designs and emphasis on luxury and glamor, these friezes feature recurring depictions of workers and class, so are more akin to Socialist Realism than Art Deco. 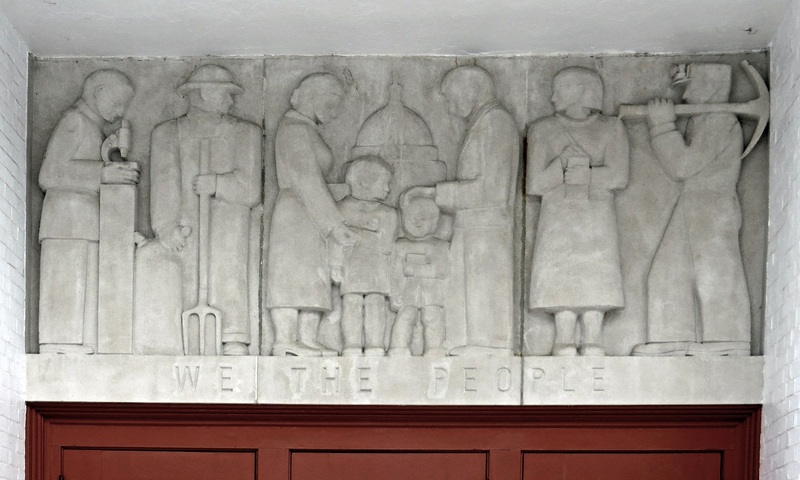 The friezes depict scenes that supposedly represent phrases from the preamble of the US Constitution; or at least that is what is chiseled on them. Because they are so noteworthy, it’s worth taking a look at each of them, to see how they depict the phrases they represent. On the left are apparently two people performing administrative tasks, operating a typewriter and a filing cabinet; while on the right, a farm worker deposits a basket of what appears to be apples. In the center, two men are shaking hands, one in a business suit and the other in overalls. Apparently we’re to believe that the “perfect union” described in the preamble to the Constitution involved a perfect union between business administration and workers. But even a casual reading of The Federalist Papers demonstrates that this is a completely wrong interpretation: the “perfect union” the preamble refers to is that of the individual states (e.g., Maryland, Pennsylvania, etc. ), united as one. Benjamin Franklin, in the reverse design for the 1776 Continental Dollar (at right), provided an excellent depiction of the concept. The design featured a ring of thirteen interlocked links forming a chain, each named for the state of the union it represents. In the center is the American Congress, defined and empowered by the Constitution, and the bold statement “WE ARE ONE.” Subsequent designs discarded the chain as potentially being evocative of slavery, but as a conceptual design representing the union of sovereign states, it’s hard to beat. In this frieze we again see representations of class. 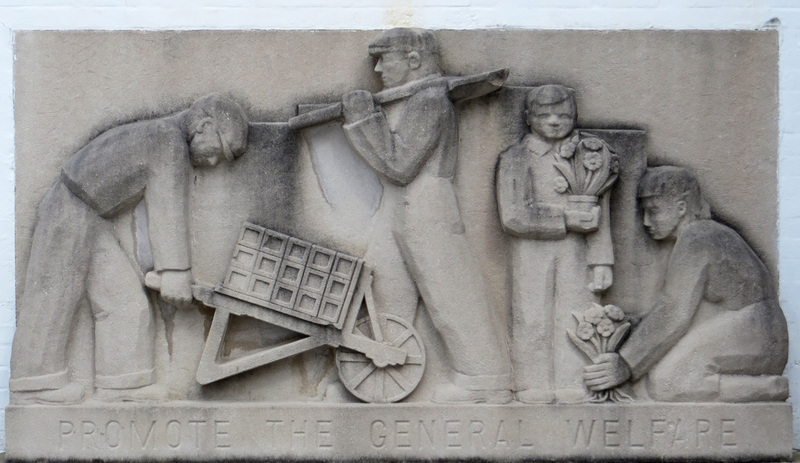 Members of society, represented by a student; an industrial worker of some sort, carrying a wrench; a mother and her child, and a farmer or construction worker with a shovel. 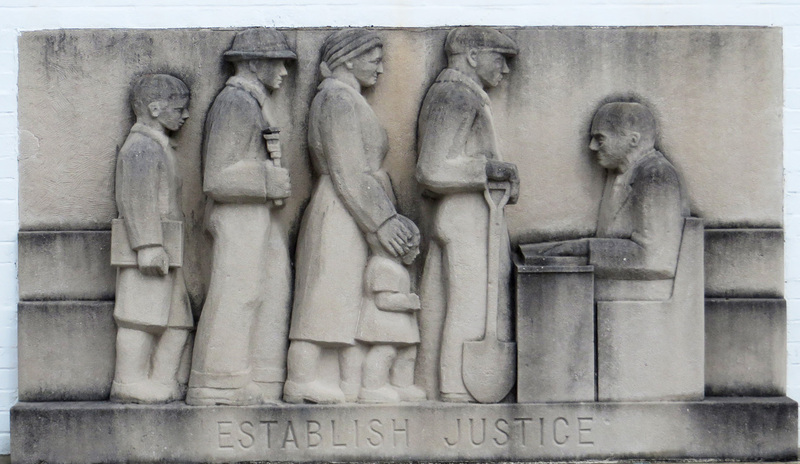 All are all queued up to receive justice from a man in a business suit sitting at a desk, presumably a judge. This is certainly a departure from the more familiar Lady Justice, blindfolded and holding a balance, who is often used to represent the impartial dispensation of justice, and it’s a far cry from James Earle Fraser’s “Contemplation of Justice” (at right) which was sculpted during the same time frame and graces the Supreme Court steps in Washington DC. 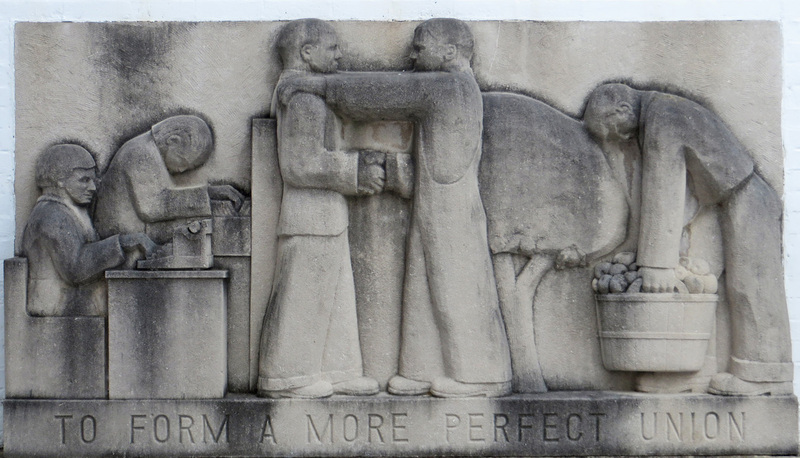 This frieze seems to depict some sort of happy balance or relationship between agricultural and industrial workers, while the domestic tranquility referred to in the Constitution had more to do with the amicable resolution of quarrels between states. Nice lunchbox, though. 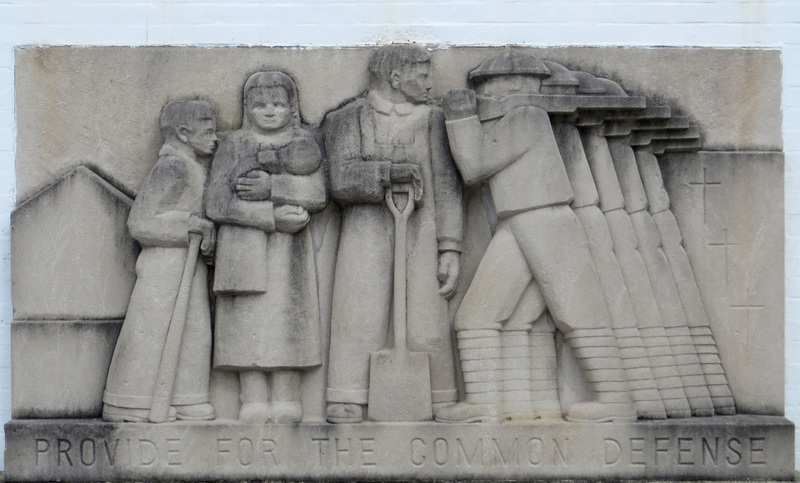 This frieze depicts a worker and his family being defended by a rank of soldiers, who curiously are facing them rather than facing outward, toward any enemy. But the image lacks the original context of a union of states: that the states are better able to defend themselves united, in common, than they would be able to separately. The classic depiction of strength in unity is the fasces, or bundle of rods, in which rods bound together are stronger than each rod would be separately. This imagery can be found in the Great Seal of the United States, in the form of the bundle of 13 arrows clutched in one of the eagle’s talons. The 1828 edition of Webster’s dictionary gives us a good sense of what the framers meant by “general welfare” as it applied to states: “Exemption from any unusual evil or calamity; the enjoyment of peace and prosperity, or the ordinary blessings of society and civil government; applied to states.” However, apart from the usual class representations of workers’ implements and garments (shovel, wheelbarrow, overalls), this frieze probably represents general welfare as it was popularly understood in the 1930s. As is no doubt apparent, I’m not very fond of Straus’s sculptures, either aesthetically or conceptually. But regardless of whether you’re a fan of Social Realism and/or the New Deal, Greenbelt is still worth a visit. Aside from the Federal government intervention at the community level, the curious imposition of monopolistic community co-ops, and intrusive and racist social engineering, many of the design features found here such as walking paths and small community parks can be found in later planned communities in the area like Fairlington or Reston, VA, and serve the community well. Stuart Chase, “A New Deal.” New York: The MacMillan Company, 1932. Michael J. Lewis, “Ego, vanity & megalomania,” The New Criterion, May 2002. The difficulty I had writing about Greenbelt was what to put in and what to leave out. There is a lot of ground to cover and a lot of related fragmentary information floating around, and I’m sure others have done more research and covered it better. 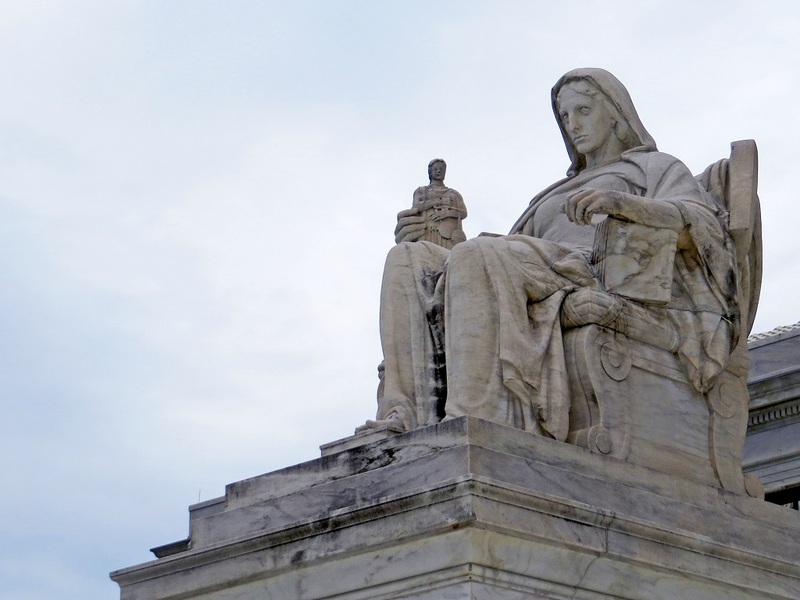 It is a mystery to me how Lenore Thomas Straus, who is politely described as a “self-taught” sculptor, landed the contract to sculpt the freizes, if contract there was, and why such great lengths were taken to create an aura of constitutionality for what seems so clearly to be an extra-constitutional overreach of Federal authority. Perhaps it had something to do with the fact that her soon-to-be husband, Robert Ware Straus, was a Special Assistant in the Information Division of the Department of the Interior, headed by Harold L. Ickes. (Not to be confused with his son, Harold M. Ickes, who served as deputy chief of staff for President Bill Clinton and later as special advisor to Hillary Clinton while she served as Secretary of State.) The Straus family lived in Accoteek, MD, where the Robert Ware Straus Ecosystem Farm today bears his name, and they were fond of hosting birdwatching get-togethers for their friends, many of which included Mr. and Mrs. Alger Hiss. What does this have to do with Greenbelt? Maybe nothing; maybe a lot. It’s clear that information from the Soviet Union formed the initial inspiration for its construction, so it would not surprise me if the information flow wound up being a two-way exchange. This entry was posted in Hiking, History and tagged Constitution, Greenbelt, New Deal, Tugwell. Bookmark the permalink. Great post! 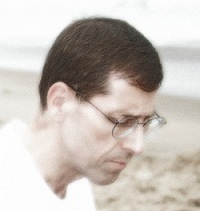 Your historical analysis is superb – your point about the “missing liberty” captures the soul of Greenbelt. I lived about a mile from there in the 1980s and I could never understand why some folks wanted to put a halo over that locale. I felt like I was in the Soviet Union! Thanks Jim! I suppose that since the original residents were carefully screened for a sense of community spirit and activism, that outlook would continue among the residents today. And since some of the design elements were incorporated into later communities, it’s understandable there would be pride that it served as a model for subsequent modern urban planning.